Happy Tuesday, which usually means Tangle Tuesday! I'm happy to say I was able to combine several drawing challenges in one sketch! Yay me! I'm finding that coming up with an idea to combine these different daily challenges is the best part of participating in these challenges. 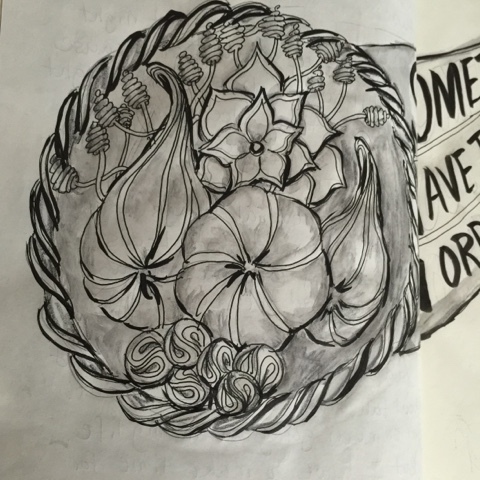 I needed to merge zentangle, cornucopia and illustrate the word fast. 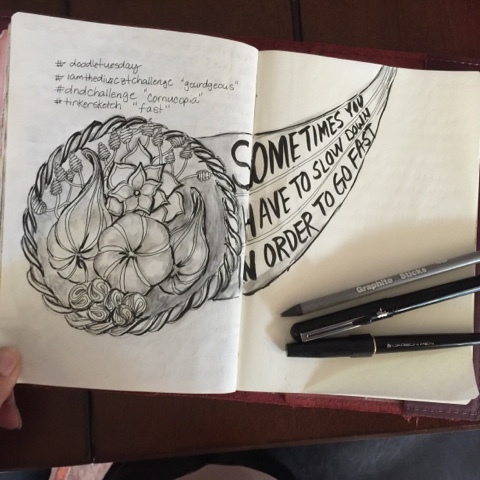 So combining zentangle and cornucopia wasn't that difficult but in order to incorporate the word fast, I had to look for a quote that would fit. And the one you see above is what came to mind. The quote is so true when it comes to zentangle. The "zen" part comes from repetitive motion of the strokes for each pattern. And when you slow the motion down, you get into a very relaxed state and creativity flows. My youngest likes to tangle with me but often she gets frustrated because she doesn't like the result. I tell her to slow down, enjoy the process. Yeah, that goes over well with a teenager! And I think the quote is true for so many different aspects of life from romance, parenting, to learning new things. Here is a closer look at the tangled parts. By the way, these are all patterns found in tanglepatterns.com so you should check it out!! Hey, Angelcake. I thought I was looking at a comet with flair, so the fast came through without the quote! I do like that quote though. So the "comet" is actually a corntangle or zencopia , huh? Cool! Wow..beautiful and love the quote! Thanks, Sharon! I have to remind myself of this all the time!